Although the consumption of wine in particular has been associated with a lower risk of atherothrombotic cardiovascular disease, systematic reviews differ as to the relative protective effect of beer, wine and spirits. Two previous studies showed that red wine reduces fatty streak formation (early atherosclerosis) but not mature atherosclerosis in apolipoprotein (apo) E-deficient (apoE-/-) mice. To determine whether a moderate beer intake would affect early and mature atherosclerotic lesion formation using control C57BL/6 and apoE-/- mice, respectively, as models. Control C57BL/6 and apoE-/- mice were randomized to receive either water, ethanol, mild beer, dark beer or ethanol-free beer. The level of beer was designed to approximate the alcohol intake currently believed to be beneficial in reducing human vascular risk. Control C57BL/6 mice were fed a Western diet for 24 weeks, and apoE-/- mice a chow diet for 12 weeks. At the end of the trial period, mice were euthanized and atherosclerotic lesions quantified. Plasma lipid concentrations were also measured. The amount of atherosclerosis and average number of lesions in the proximal aortic region did not differ among groups in control C57BL/6 mice (p = 0.32 and p = 0.29, respectively) and apoE-/- mice (p = 0.19 and p = 0.59, respectively). No consistent differences were observed in plasma lipid and lipoprotein concentrations among water, ethanol and beer groups. Moderate beer consumption does not change the development of early or mature atherosclerosis in mice. Our findings do not support the hypothesis of an anti-atherogenic effect of beer. Other potential protective actions of moderate beer consumption such as plaque stabilization, a reduction in plaque intrinsic thrombogenicity, or a reduction in the systemic propensity to thrombosis, remain to be studied. Although the moderate consumption of wine has been associated with a lower risk of atherothrombotic cardiovascular disease, systematic reviews differ as to the relative protective effect of beer, wine and spirits [1–3]. Interestingly, in a recent analysis of 38,077 men over 12 years of follow-up, moderate alcohol consumption was consistently associated with a lower risk of coronary heart disease, regardless of the type of beverage . Control C57BL/6 mice and genetically-modified mice such as apolipoprotein (apo) E-deficient mice (apoE-/- mice) are now widely used to examine the impact of dietary factors on early and mature atherosclerosis [5, 6]. Reduction in cardiovascular risk seen in moderate consumption of alcoholic beverages could be caused by atherosclerosis inhibition. Previous studies have examined the effects of red wine in mouse models of atherosclerosis [7, 8]. Two of these studies showed that red wine consumption reduces fatty streak (early atherosclerosis) but not mature atherosclerosis in apoE-/- mice [7, 8]. However, no studies have tested the effects of beer consumption on atherogenesis in these mice. Thus, the aim of the present study was to determine whether a moderate beer intake would affect early and mature atherosclerotic lesion formation in control C57BL/6 and apoE-/- mice, respectively. This study was designed in accordance with the Helsinki declaration of 1975 and the guidelines for the care and use of laboratory animals . Use of control C57BL/6 mice and apoE-/-mice with a C57BL/6 background has been described previously [10, 11]. At 8 weeks of age, seventy-one female C57BL/6 mice were randomized into five groups and given water (n = 14), ethanol (n = 13), mild beer (n = 15), dark beer (n = 15) or ethanol-free beer (n = 14). Forty-nine 8-week-old female apoE-/- mice were also assigned randomly to five groups and given water (n = 11), ethanol (n = 10), mild beer (n = 10), dark beer (n = 9) or ethanol-free beer (n = 9). From three to five mice were housed in each solid-floored cage and were kept in a room maintained at 22°C, humidity 60% on a 12 h light-dark cycle. 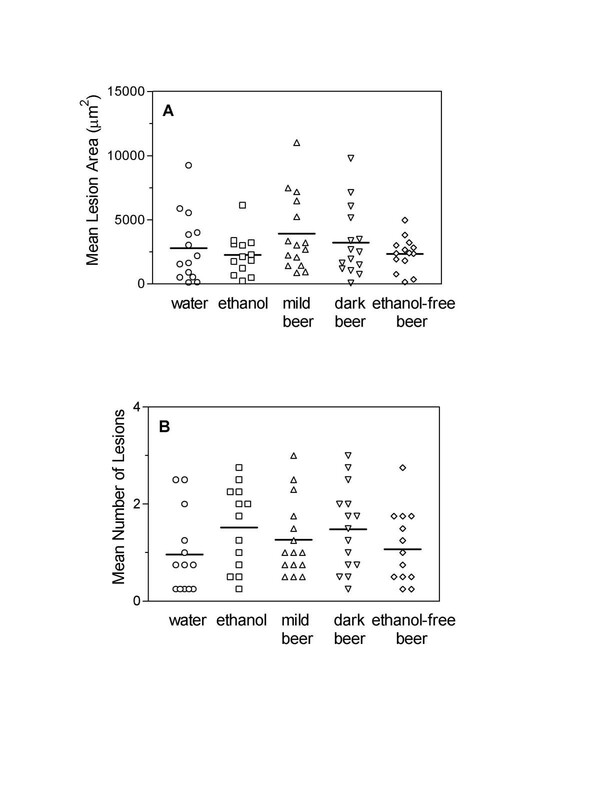 Different dilutions of ethanol were prepared for the different groups of animals to correct, as far as possible and based on preliminary experiments, for the differences in fluid intake observed among mild beer, dark beer and ethanol groups. Thus, mild beer and dark beer (a lager and a bock beer, respectively, from Damm group, Barcelona, Spain, with an alcohol content of 5.4% volume) were diluted to an ethanol concentration of 1.62% v/v. Ethanol-free beer group (lager beer without ethanol from Damm group) received water containing 30% v/v ethanol-free beer. Ethanol was prepared in a 2.7% v/v for ethanol-treated C57BL/6 mice and in a 3.5% v/v solution for ethanol-treated apoE-/-mice. All these solutions were given as the only source of liquid during the study. Fluid consumption was recorded and all fluids were changed twice weekly. Each mouse type was fed an appropriate diet to induce atherosclerosis and prevent liver toxicity. Control C57BL/6 were fed a high-fat Western diet (TD 88137 Harlan Teklad, Madison, WI, USA; containing 42% of calories from fat, 21% anhydrous milk fat and 34.1% carbohydrate, primarily sucrose) for 24 weeks, and apoE-/-mice were fed a regular chow diet (Rodent Toxicology Diet; B&K Universal, N. Humberside, UK) for 12 weeks. Blood was obtained from the tail veins of mice fasted overnight, when they had free access to liquid, and collected in tubes containing EDTA and sodium azide. Plasma total cholesterol, triglycerides and glucose were determined enzymatically using commercial kits adapted to an BM/HITACHI 911 autoanalyzer (Roche Diagnostics, Mannheim, Germany). Triglyceride determinations were corrected for the free glycerol present in plasma (Sigma Diagnostics, St. Louis, MO, USA). HDL cholesterol was measured after precipitation with phosphotungstic acid and magnesium ions (Roche Diagnostics). In the case of apoE-/- mice, lipidemic plasmas were diluted 1:2 with saline prior to precipitation of apoB-containing lipoproteins and, in all cases, the supernatant was clear. Non-HDL cholesterol was calculated as the difference between total cholesterol and HDL cholesterol [11, 12]. At the end of the trial period, fasting mice were euthanized. The heart and proximal aorta were removed and washed in 0.9% NaCl. The basal portion of the heart and proximal aorta were removed, embedded in OCT compound (Tissue-Tek. Sakura Finetek Europe, Zoeterwoude, The Netherlands), and sectioned as previously described . Oil red O staining of lesion areas present in the proximal aorta was measured in each mouse in four 10-μm sections interspaced by 80 μm. The first section was taken 80 μm distal to the point placed just beyond the aortic sinus and at the beginning of the aorta. Video images were captured directly from a color video camera (TK-C621, JVC) attached to an Olympus-BX50 microscope and displayed on an ADI microScan 5V/5V+ monitor. Lesion areas were measured blindly with a PC Image analysis software (PC image, version 2.2.02, Foster Findlay Associates Ltd, Newcastle upon Tyne, UK). A calibration slide was used to scale the image analysis system. In the case of fibroproliferative lesions of apoE-/-mice, the area quantified included all lesions (from the lumen to the normal vessel wall) and not just the fatty portion. One-way ANOVA with Tukey's multiple comparison post test was performed using GraphPad Prism version 3.0 for Windows (GraphPad Software, San Diego, CA, USA). A value of P < 0.05 was considered statistically significant. Mice seemed healthy during the study and tolerated well the beverages containing ethanol, mild beer, dark beer and ethanol-free beer. Initial body weights, weight gains during the study and glucose levels were similar in all groups of Western-fed control C57BL/6 mice and chow-fed apoE-/-mice (Tables 1 and 2). When the fluid intake per cage was averaged among the number of mice in each cage, marked differences existed among groups. 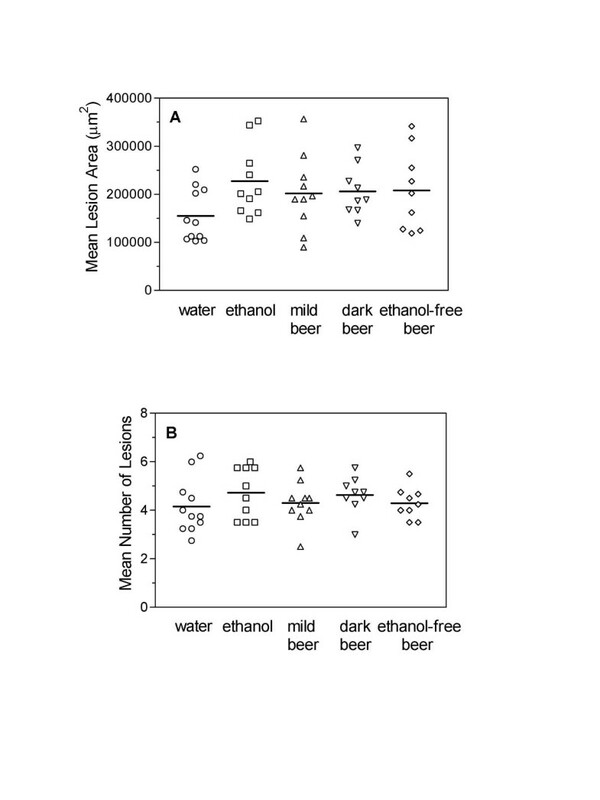 Fluid intake in all beer-treated mice groups was higher than those of water and ethanol mice groups and, also, that of mice drinking ethanol was higher than those drinking water (Tables 1 and 2). However, as this difference in fluid intake was noted in preliminary experiments, ethanol in drinking water of the different mice groups was adjusted to deliver approximately the same amount of ethanol per day to each mouse (see Methods and Tables 1 and 2). This was generally accomplished with the exception of the ethanol intake in dark beer apoE-/-mice, which was higher than in the ethanol group as a consequence of the increased fluid intake of the former (Table 2). Data are expressed as mean ± SEM, * P < 0.05, compared with the water group, ** P < 0.05, compared with the ethanol group. Control C57BL/6 mice that consumed the Western diet showed small fatty streak-type lesions (early atherosclerosis) with extra cellular lipid deposition and few, scattered mononuclear cells, including foam cells. The amount of atherosclerosis in the proximal aortic region did not differ among groups (P = 0.32 by ANOVA), with lesion areas of 2800 ± 714, 2266 ± 436, 3913 ± 762, 3226 ± 701, and 2342 ± 350 μm2 in the water, ethanol, mild beer, dark beer, and ethanol-free beer groups, respectively (Fig. 1A). We also quantified the number of atherosclerotic lesions in the four proximal aortic sections. The average number of lesions was not significantly different (P = 0.29 by ANOVA): 0.96 ± 0.22, 1.52 ± 0.24, 1.27 ± 0.20, 1.48 ± 0.22, and 1.07 ± 0.20, in water, ethanol, mild beer, dark beer and ethanol-free beer groups, respectively (Fig. 1B). Susceptibility to atherosclerosis in C57BL/6 mice. Atherosclerotic lesion areas (A) and number of lesions (B) in all groups of C57BL/6 mice fed a Western diet. Each point represents the average lesion area and mean number of lesions of four proximal aortic sections from each animal. Group means are indicated by horizontal bars. Average lesion areas and mean number of aortic lesions were similar in all groups of western-fed C57BL/6 mice (p = 0.32 and 0.29, respectively). Aortic lesions in apoE-/-mice progressed to the degree of mature and complex fibrofatty plaques resembling advanced human lesions. Mean plaque area was similar in all groups (P = 0.19 by ANOVA): 155500 ± 16620, 227500 ± 23020, 202100 ± 24780, 206600 ± 17080, and 208700 ± 27850 μm2 in the water, ethanol, mild beer, dark beer and ethanol-free beer groups, respectively (Fig. 2A). Again, no differences in the number of atherosclerotic lesions were detected among groups (P = 0.59 by ANOVA): 4.16 ± 0.34, 4.73 ± 0.33, 4.3 ± 0.28, 4.64 ± 0.25, and 4.30 ± 0.21 lesions in the water, ethanol, mild beer, dark beer and ethanol-free beer groups, respectively (Fig. 2B). Susceptibility to atherosclerosis in apoE-/- mice Atherosclerotic lesion areas (A) and number of lesions (B) in all groups of apoE-/- mice fed a chow diet. Each point represents the average lesion area and mean number of lesions of four proximal aortic sections from each animal. Group means are indicated by horizontal bars. Average lesion areas and mean number of aortic lesions were similar in all groups of chow-fed apoE-/- mice (p = 0.19 and 0.59, respectively). At the end of the study, non-HDL-cholesterol decreased in Western-fed control C57BL/6 mice given mild beer, dark beer and ethanol-free beer, compared with mice drinking water. HDL-cholesterol decreased after administration of dark beer (Table 1). Chow fed apoE-/- mice given ethanol had higher non-HDL-cholesterol than the group drinking water, whereas the group drinking mild beer presented increased triglycerides (Table 2). None of these lipid parameters correlated with atherosclerosis in either of the two types of mice studied (data not shown). Several previous studies have examined the effects of ethanol and red wine on mouse models of atherosclerosis [7, 8, 14–16]. Evidence for an antiatherogenic effect of ethanol in these mouse trials has not been conclusive [8, 14–16]. This discrepancy is probably due to differences between mouse models and/or diets used. A high-fat atherogenic diet containing cholic acid  has been used in several of these studies. This diet had proinflammatory and hepatotoxic effects that could interfere in studies on atherosclerosis [14–16]. For this reason, we used control C57BL/6 fed a Western-type diet as a model of early atherosclerosis. This diet is rich in saturated fat and induces a time-dependent obesity and insulin resistance state but, being cholic acid-free, does not induce hepatotoxicity. None of the different beers used nor ethanol protected against early atherosclerosis in this model. In addition, we used the well-established atherosclerosis-prone apoE-/-mice as a model of mature atherosclerosis [5, 6]. Our findings show that ethanol does not protect against atherosclerosis in apoE-/- mice and this is consistent with the lack of effects of ethanol and red wine also found in this model . However, another study  showed that red wine consumption reduces fatty streak (early atherosclerosis). To our knowledge, the present study is the first to report the effects of beer consumption on atherogenesis in mice. Our data do not suggest a protective effect of either ethanol or beer on the extent of early and advanced atherosclerosis in mice. Furthermore, no consistent differences were observed among plasma lipid and lipoprotein concentrations of the water, ethanol and beer groups. This lack of effect does not seem to be due to an insufficient dose. The full cardioprotective effect of ethanol in epidemiological studies is seen with intakes of ≥ 1.5-drink per day [3, 4]. Mice drank an average of 4.6 ± 0.1 mL of diluted beer containing 1.62% ethanol per day. This is comparable to a 70-kg human consuming 2.5 standard drinks of 6% ethanol (a drink being considered equivalent to 150 mL of beer) per day . However, at this point, a different dose-related effect of alcoholic beverages in mice and humans cannot be completely ruled out. In conclusion, our results do not suggest a protective effect of beer consumption on early (in contrast with findings in wine) or mature atherosclerosis in mice. However, given the well-known species-specific differences between mice and humans in regard to lipoprotein metabolism and atherosclerosis susceptibility, our results should not be interpreted as ruling out an antiatherogenic effect in humans. It is also possible that the reduced incidence of myocardial infarction seen with moderate beer drinkers could be caused by a stabilization of plaque, a reduction in plaque intrinsic thrombogenicity, or a reduction in the systemic propensity to thrombosis. All these are also fundamental steps towards developing atherothrombotic cardiovascular disease. Therefore, further studies will be required to ascertain the effects of beer on these important steps towards atherothrombotic cardiovascular disease as well as its relative protective effect compared with other alcohol-containing beverages. This work was supported by a grant from the Fundación Cerveza y Salud. During part of this work J.C.E-G was funded by the Programa Ramón y Cajal del Ministerio de Ciencia y Tecnología. V.R. and L.C-B are predoctoral fellows of the Ministerio de Ciencia y Tecnología and the FIS program G03-181, respectively. We are grateful to Christine O'Hara for editorial assistance. JC. Escolà-Gil participated in the design of the study, performed statistical analysis and drafted the manuscript. L.Calpe-Berdiel carried out the atherosclerosis studies. V. Ribas carried out the lipid studies. F. Blanco-Vaca conceived the study, and participated in its design and coordination. All authors read and approved the final manuscript.